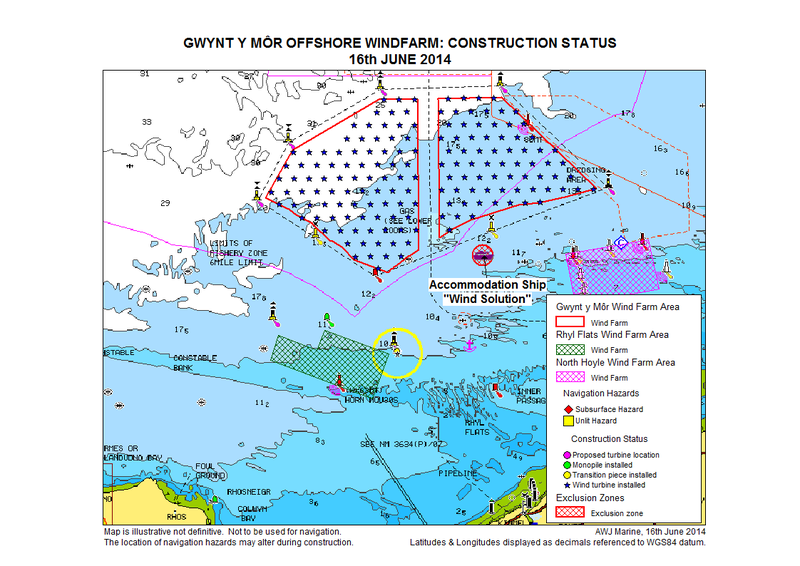 This is a summary of the weekly notice of operations for the Gwynt y Môr Offshore Windfarm issued on 16th June 2014 to harbour masters and sea users. This notice describes progress with construction, recent operations, work planned for the next 7 days, and provides a list of vessels operating on the site with their contact details. Array cables: 113 array cables installed, 48 remaining. Wind Turbine Generators: 160 installed, 0 remaining. Installation is complete, apart from the blades on one turbine. Scirocco, Gaillion, Abersoch Bay, Gardian 10, Santa Ana, EMS Viking, Chinook, Sea Storm, Bayard 2 and Bayard 5 utilised as Crew Transfer Vessels when required sailing from Canada Dock 3 and Liverpool Marina. Survey vessels RV Discovery and Ernest Shackleton continued UXO survey operations at the windfarm (see notice to mariners for RV Discovery here, and here for the Ernest Shackleton). Scirocco, Gaillion, Abersoch Bay, Gardian 10, Santa Ana, Sea Storm, EMS Viking, Chinook, Bayard 2 and Bayard 5 will be utilised as Crew Transfer Vessels when required sailing from Canada Dock 3 and Liverpool Marina. Survey vessels RV Discovery and Ernest Shackleton will continue UXO survey operations (see notice to mariners for RV Discovery here, and here for the Ernest Shackleton).